Introduction: Turmeric commonly known as “Haldi” is a popular spice frequently used in Indian foods and curry. Turmeric holds a high place in Ayurvedic medicine as a"detoxifier of the body,” and today, science has documented several diseased conditions that can be healed by the active ingredients of turmeric. Curcumin is the most active constituent of turmeric curcuminoids obtained from the rhizome of Curcuma longa. Curcumin has been found to have antioxidant, anti-tumor, anti-inflammatory, antiviral, antibacterial, antifungal, analgesic, anti-allergic, antiseptic properties and thus has a potential against various diseases. Due to these properties it was felt that promotion of turmeric in dental practice may prove beneficial. Materials and Methods: The study was conducted in the Department of Periodontology, Faculty of Dental Sciences, King George's Medical University, Lucknow, India. A total of 40 subjects of both the sexes from age group 20-35 years. Simple random sampling was followed and the participants were assigned to two groups 'A' and 'B' of 20 participants each. Group A subjects were advised 0.2% chlorhexidine gluconate gel. Group B 30 subjects were advised experimental (turmeric) gel. Statistical Analysis: Data were summarized as mean ± SD. Pre and post outcome measures of two groups were compared by repeated measures analysis of variance (RM ANOVA) using general linear models (GLM) and the significance of mean difference within and between the groups was done by Bonferroni post hoc test after adjusting for multiple contrasts (comparisons). Conclusions: Based on the observations of our study, it can be concluded that chlorhexidine gluconate as well as turmeric gel can be effectively used as an adjunct to mechanical plaque control in prevention of plaque and gingivitis. chlorhexidine gluconate gel has been found to be more effective when antiplaque and anti-inflammatory properties were considered. The effect of turmeric observed may be because of its anti-inflammatory action. The antiplaque action of chlorhexidine gluconate is due to its substantivity. Substantivity of tutmeric is required to be further studied. Dental plaque has been proved by extensive research of to be a paramount factor in initiation and progression of gingival and periodontal diseases. These are affecting the majority of the population across the world. The direct relationship has been established between plaque levels and the severity of periodontal diseases. The most rational methodology toward the prevention of periodontal diseases would be regular, effective removal of plaque by the personal oral hygiene protocol. Procedures for plaque control include mechanical and chemical means. Mechanical means include brushing, flossing, use of interdental cleansing aids, and oral prophylaxis. These methods have proved to be very time-consuming and their effectiveness would depend on skills and technique of the individual carrying out these procedures. The fact that most people experience difficulty in maintaining adequate levels of plaque control particularly at interproximal sites necessitates the use of chemicals for control of plaque. Thus, chemical plaque control can be used as an adjunct to mechanical plaque control procedures. Recently, a number of chemical agents have been advocated such as essential oils, fluorides, bisbiguanides, sanguinarine, quaternary ammonium salts, and triclosan which are either available in a toothpaste/dentifrices or in the form of a mouthwash. Among them, chlorhexidine is regarded as gold standard in dentistry for the prevention of dental plaque. The various mouthwashes available today are having certain side effects and are also expensive. Chlorhexidine mouthwash though very effective also has certain side effects such as brown discoloration of the teeth, oral mucosal erosion, and bitter taste. Hence, there is a requirement was felt of an alternative medicine that could provide a product already enmeshed within the traditional Indian set-up and is also safe and economical. Turmeric commonly known as “Haldi” is a popular spice frequently used in Indian foods and curry. Turmeric holds a high place in Ayurvedic medicine as a “detoxifier of the body,” and today, science has documented several diseased conditions that can be healed by the active ingredients of turmeric. Curcumin is the most active constituent of turmeric curcuminoids obtained from the rhizome of Curcuma longa. Curcumin has been found to have anti-oxidant, anti-tumor, anti-inflammatory, anti-viral, anti-bacterial, anti-fungal, analgesic, anti-allergic, anti-septic properties, and thus has a potential against various diseases. Due to these properties, it was felt that the promotion of turmeric in dental practice may prove beneficial. Considering above claims, this study was carried out using the purest and soluble form of turmeric to test its anti-plaque and anti-inflammatory properties in the form of a mouth gel. The study was conducted in the Department of Periodontology, Faculty of Dental Sciences, King George's Medical University, Lucknow, India. A total of 40 subjects of both the sexes from age group 20 to 35 years who met the following inclusion criteria were recruited for the study: (1) Subjects with mild to moderate gingivitis; (2) subjects having all the teeth erupted (third molars not included). Exclusion criteria were: (1) Smokers; (2) subjects suffering from systemic diseases; (3) pregnant and lactating females; (4) subjects with oral habits such as bruxism, mouth breathing; (5) subjects wearing any appliances or prosthesis. Ethical clearance was obtained from Institutional Ethics Committee before commencement of the study, and all the participants recruited were signed a written informed consent in accordance with the Helsinki Declaration of 1975 as revised in 2000. Simple random sampling was followed, and the participants were assigned to two groups “A” and “B” of 20 participants each. Group A subjects were advised 0.2% chlorhexidine gluconate gel. Group B 30 subjects were advised experimental (turmeric) gel. The gingival index (GI) by Loe and Silness  was recorded which was followed by Loe and Silness plaque index (PI). Recording of indices was done on 0, 14, and 21 days; and all records were maintained on case history proforma. After recording PI and GI thorough scaling and polishing were carried out to get subjects at the baseline. Instructions for maintenance of oral hygiene were given. For a period of 21 days, the groups A was advised to use chlorhexidine gel and group B was advised to use turmeric gel twice daily after brushing. The parameters were recorded for PI and GI at day 0, on the 14th day, and 21st day. Chlorhexidine gel (Elugel-0.2%) was procured from Win-Medicare Pvt limited, and turmeric gel was procured from National Botanical Research Institute (NBRI) Lucknow. The clinical data were compiled and subjected to statistical analysis. The rhizomes of C. longa were collected from Council of Scientific and Industrial Research (CSIR)-NBRI Experiment Station Banthra located at 25 km East of Lucknow and authenticated by Dr. S.K. Tewari, Department of Agronomy, CSIR-NBRI. A specimen has been deposited at the Herbarium of same Institute. The fresh rhizomes of C. longa were extracted with alcohol. The crude extract was obtained by evaporating the solvent under reduced pressure at 45°C to afford the extract, which was stored in a dark bottle and kept at 4°C until analysis. The preparation of extract formulation – An appropriate amount of crude extract and glycerin was mixed to prepare extract mixture in different ratio and control glycerin, the formulation, which was used in our study was extracted: Glycerin: 75:25. Data were summarized as mean ± standard deviation (SD) Pre- and post-outcome measures of two groups were compared by repeated measures analysis of variance using general linear models, and the significance of mean difference within and between the groups was done by Bonferroni post-hoc test after adjusting for multiple contrasts (comparisons). A two-sided (α =2) P < 0.05 was considered statistically significant. Analyses were performed on SPSS software. The pre- (baseline) and post- (after 2 weeks and after 3 weeks) PI of two groups are summarized in [Table 1] and shown graphically in [Figure 1]. The mean PI in both groups decrease after the treatment, and the decrease was evident higher in Group A (CHX) than Group B (turmeric gel). On comparing the mean PI within the groups, the PI in Group A (CHX) decreases significantly after 2nd and 3rd week with mean (±SD) 1.11 ± 0.59 and 1.20 ± 0.62, respectively as compared to baseline. However, the mean PI did not decrease significantly (P > 0.05) after 3 weeks as compared to 2 weeks though it decreases by 0.09 ± 0.36. Similarly, in Group B (turmeric gel), the PI decreases significantly after 2nd and 3rd week with mean (±SD) 0.88 ± 0.53 and 0.93 ± 0.50, respectively as compared to baseline. 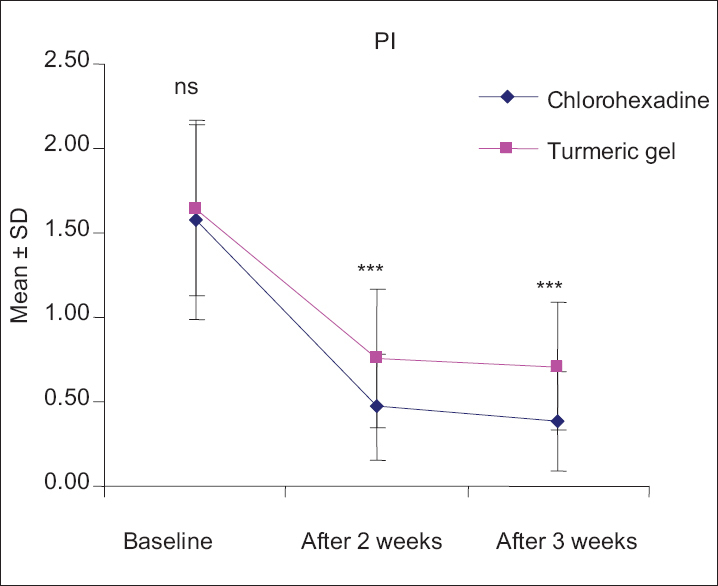 However, like Group A (CHX), mean PI in turmeric gel group did not decrease significantly (P > 0.05) after 3 weeks as compared to 2 weeks though it decreases by 0.05 ± 0.42. Further, comparing the mean PI between the groups, the PI did not differ (P > 0.05) between the two groups at baseline indicating that PI was comparable. However, after 2nd and 3rd week, the mean PI in CHX group decrease significantly (P < 0.001) and found to be 20.9% and 22.7%, higher respectively, as compared to the turmeric gel group. The pre- (baseline) and post- (after 2nd and 3rd week) GI of two groups are summarized in [Table 2] and shown graphically in [Figure 2]. The mean GI in both groups decreases after the treatment, and the decrease (improvement) was evident higher in Group A (CHX) than Group B (turmeric gel). Comparing the mean GI within the groups, the GI in CHX group decrease significantly after both 2 weeks and 3 weeks with mean (±SD) 1.28 ± 0.51 and 1.35 ± 0.58, respectively as compared to baseline. However, the mean GI did not decrease significantly (P > 0.05) after 3 weeks as compared to 2 weeks though it decreases by 0.07 ± 0.41. Similarly, in turmeric gel group, the GI also decreases significantly after 2 weeks and 3 weeks with mean (±SD) 0.99 ± 0.70 and 1.01 ± 0.68, respectively as compared to baseline. 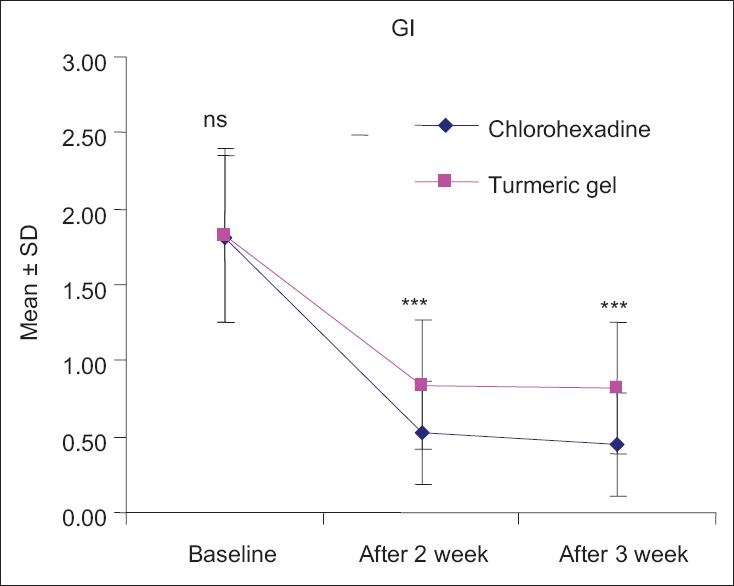 However, like CHX group, mean GI in turmeric gel group did not decrease significantly (P > 0.05) after 3 weeks as compared to after 2 weeks though it decreases by 0.02 ± 0.50. The pre- (baseline) and post- (after 2 weeks and after 3 weeks) sulcus bleeding index (SBI) of two groups are summarized in [Table 3] and also shown graphically in [Figure 3]. The mean SBI in both groups decrease (improve) after the treatments, and the decrease (improvement) was evident higher in CHX group than turmeric gel group. Comparing the mean SBI within the groups, the SBI in CHX group decrease significantly after 2 weeks and after 3 weeks with mean (±SD) 1.70 ± 0.91 and 1.73 ± 0.92, respectively, as compared to baseline. However, the mean SBI did not decrease significantly (P > 0.05) at after 3 weeks as compared to at after 2 weeks though it decreases by 0.03 ± 0.39. Similarly, in turmeric gel group, the SBI also decrease significantly after both 2 weeks and after 3 weeks with mean (±SD) 1.33 ± 0.82 and 1.34 ± 0.78, respectively, as compared to baseline. 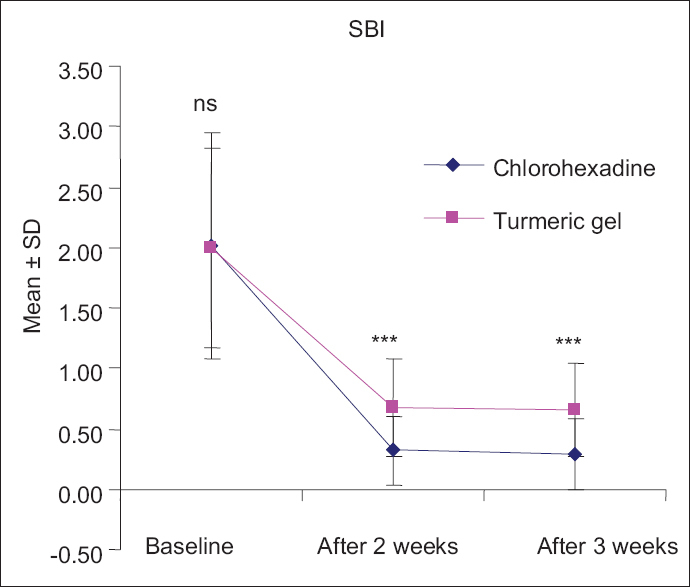 However, like CHX group, mean SBI in turmeric gel group did not decrease significantly (P > 0.05) after 3 weeks as compared after 2 weeks though it decreases by 0.02 ± 0.43. Further, comparing the mean SBI between the groups, the SBI did not differ (P > 0.05) between the two groups at baseline indicating that SBI was comparable. However, after 2 weeks and 3 weeks, the mean SBI in CHX group decrease significantly (P < 0.001), and 22.1% and 22.3%, higher respectively, as compared to the turmeric gel group. Chlorhexidine has been regarded as a “gold” standard in dentistry for the prevention of plaque and gingivitis. The results indicated that two daily application with 0.2% chlorhexidine gluconate effectively prevented plaque formation. In our study, chlorhexidine gel showed a significant reduction in the mean plaque score at 0, 14th, and 21st day from baseline similar to the study by Löe and Schiott. This may be because of the anti-plaque property of chlorhexidine gluconate and concentration used in our study was 0.2%, and routine oral hygiene were also advised. The study carried out by Francetti et al. showed the similar anti-plaque activity of chlorhexidine. Our results related to turmeric are consistent with a study carried out by Bhandari and Shankwalker  where turmeric was used as a mouth wash. Reduction in mean PI was observed from 0 to 21st day. In our study, similar results were obtained with subjects using turmeric gel. This may be because of the anti-plaque effect of turmeric. A comparable anti-plaque effect was found with turmeric and chlorhexidine mouthwash in our study. This may be because of turmeric, which was in pure and completely water-soluble form, so the available concentration was more, and it may also be because of its anti-plaque property. Significant plaque reduction from the baseline to day 14 and to day 21 was observed with both the mouthwashes. Comparing the mean PI between the groups, the PI did not differ (P > 0.05) between the two groups at baseline. However, after 2nd and 3rd week, the mean PI in CHX group decrease significantly (P < 0.001) and found to be 20.9% and 22.7%, higher respectively, as compared to Curcumin group. This may be due to the property of substantivity of chlorhexidine and also the action of chlorhexidine at different levels of plaque formation. Though independently turmeric showed anti-plaque effect, in comparison to chlorhexidine it was observed to be less effective. In our study, the anti-inflammatory action of turmeric was evaluated on clinical parameters using the GI and SBI, which showed a significant reduction. The mean GI and SBI in both the groups decrease after the treatment, and the decrease was evident higher in Group A (CHX) than Group B (Curcumin). In the studies carried by Grundenmann et al. and Van der Weijden et al., a significant reduction of gingival inflammation using chlorhexidine was observed similar to our study. Arora et al. also evaluated the anti-inflammatory property of turmeric. The result showed significant reduction of inflammation. Our results are similar to them and also in accordance with a study carried by Srimal and Deodhar (1979) and Ghatak and Basu. This suggests that turmeric has anti-inflammatory property. In the above studies, in relation to turmeric anti-inflammatory effect was observed but not in relation with the gingiva. In the present study, anti-inflammatory effect of turmeric was evaluated on clinical parameters using GI and SBI. The possible mechanism of action of turmeric as an anti-inflammatory agent could be due to the inhibitory action of inflammatory mediators of arachidonic acid metabolism. It selectively inhibits synthesis of prostaglandin E2 and thromboxane while not affecting synthesis of prostacyclin. Turmeric, by virtue of its anti-inflammatory property reduces inflammatory mediators and causes shrinkage by reducing inflammatory edema and vascular engorgement of connective tissue. It has also been shown that curcumin incorporated in collagen which acts as a supportive matrix for slow release increases wound reduction and enhances cellular proliferation. Based on the observations of our study, it can be concluded that chlorhexidine gluconate, as well as turmeric gel, can be effectively used as an adjunct to mechanical plaque control in the prevention of plaque and gingivitis. Chlorhexidine gluconate gel has been found to be more effective when anti-plaque and anti-inflammatory properties were considered. The effect of turmeric observed may be because of its anti-inflammatory action. The anti-plaque action of chlorhexidine gluconate is due to its substantivity. Substantivity of turmeric is required to be further studied. To recommend the use of turmeric, it is required to carry out a long-term study on a large sample to evaluate its efficacy as an anti-plaque and anti-inflammatory agent, and to study its substantivity and other properties. We are thankful to Mr. M.P.S. Negi, Institute for Data Computing and Training (I.D.C.T. ), Lucknow for providing valuable assistance in data analysis. Fine DH. Chemical agents to prevent and regulate plaque development. Periodontol 2000 1995;8:87-107. Mali AM, Behal R, Gilda SS. Comparative evaluation of 0.1% turmeric mouthwash with 0.2% chlorhexidine gluconate in prevention of plaque and gingivitis: A clinical and microbiological study. J Indian Soc Periodontol 2012;16:386-91. Lindhe J. Text Book of Clinical Periodontology and Implant Dentistry. 5th ed. 2008. p. 748-54. Löe H, Schiott CR. The effect of mouthrinses and topical application of chlorhexidine on the development of dental plaque and gingivitis in man. J Periodontal Res 1970;5:79-83. Francetti L, del Fabbro M, Testori T, Weinstein RL. Chlorhexidine spray versus chlorhexidine mouthwash in the control of dental plaque after periodontal surgery. J Clin Periodontol 2000;27:425-30. Bhandari H, Shankwalkar GB. Clinical assessment of action of combination of indigenous drugs on dental plaque, calculus and gingivitis. Dissertation Submitted to the University of Bombay; 1980. Grundenmann LJ, Timmerman MF, Ijserman Y, van der Velden U, van der Weijden GA. Reduction of stain, plaque and gingivitis by mouth rinsing with chlorhexidine and sodium perborate. Ned Tijdschr Tandheelkd 2002;109:225-9. Van der Weijden GA, Timmer CJ, Timmerman MF, Reijerse E, Mantel MS, van der Velden U. The effect of herbal extracts in an experimental mouthrinse on established plaque and gingivitis. J Clin Periodontol 1998;25:399-403. Arora RB, Kapoor V, Basu N, Jain AP. Anti-inflammatory studies on Curcuma longa (turmeric). Indian J Med Res 1971;59:1289-95. Srimal RC, Deodhar. Pharmacology of deferuloylmethane (curcumin), a non-steroidal anti-inflammatory agent. Pharmacology of curcumin. Communication no. 1789. Lucknow: Central Drug Research Institute; 1979. Ghatak N, Basu N. Sodium curcuminate as an effective anti-inflammatory agent. Indian J Exp Biol 1972;10:235-6. Suhag A, Dixit J, Dhan P. Role of curcumin as a subgingival irrigant: A pilot study. PERIO 2007;4:115-21. Gopinath D, Ahmed MR, Gomathi K, Chitra K, Sehgal PK, Jayakumar R. Dermal wound healing processes with curcumin incorporated collagen films. Biomaterials 2004;25:1911-7.